It was really fun to see Muse Challenge #203 and I thought I'd try playing along. 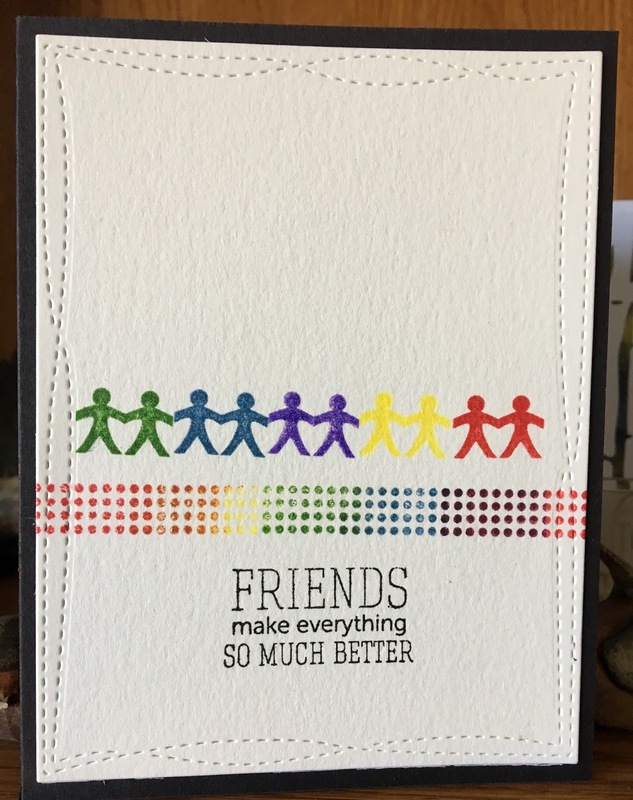 My take on Tracey's card included the rainbow idea including the idea of caring friends. I was organizing my stamps and found myself in the Mama Elephant bin, so as fate would have it I used the Mama Elephant little people from the 'Good Times Roll' set, one of the border stamps from their 'Basic Borders' set, and the sentiment is from 'Ella and Friends'. 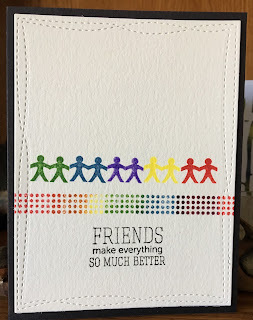 I tried to blend the Distress inks in rainbow order and also stamped the little people in some sort of blending order. I die cut the panel with My Favorite Things 'Wonky Stitched Rectangles' and mounted it on some black cardstock. Voila! Tracey's card is right below. Oh I could agree with your sentiment more! Just love that little rainbow of friends! Thank you for sharing with us at Muse this week! Love this rainbow of people and the blended border! So glad you joined us at Muse this week!